June 2 is a national holiday in Italy known as the Festival of the Republic (Festa della Repubblica). It commemorates the day in 1946 when Italians voted to do away with their monarchy. They exiled their royal family and became a republic. October is Italian Heritage Month in the United States. I’ve grown up under the influence of Italians all my life. I’m a second-generation Italian American. That means my grandfathers immigrated. Both of my parents are 100 percent Italian. I not only have the DNA tests to prove it, but also one has only to give a quick glance at the first four generations of my family surnames (Pizzillo, Miceli, DiNauta, D’Ippolito, Sedita, Benvenga, Lombardi, Garone). I rest my case. The funny thing is, you don’t have to be 100 percent Italian to be considered Italian. Heck, I’ve seen people with one percent or no percent Italian in their bloodlines who express love and pride for things Italian as if they were native Italian. Welcome to living under the influence of Italians and the love of all things Italy—Club Italophile. Spurred by hard economic times in Italy and the irresistible allure of a life without limitations in America, my grandparents and great-grandparents on all branches of my tree migrated to the United States during the heyday of Italian immigration from 1880 to 1910. By 1924, over four million Italians had made the voyage to the United States. They boarded ships mostly in Palermo, Sardinia, and Naples, and spent weeks at sea before arriving in various ports in the United States, but mostly in New York and New Orleans. I never look out over the ocean or the Gulf of Mexico but what I am compelled to envision what the hardships of those voyages must have been like and how I am the by-product of my ancestors’ zeal for a better life in America. Equipped only with determination, unfettered love of family, a few lira (the Italian currency at the time), a suitcase of clothes and a few family mementos, they were undaunted by the fact that they didn’t know the language in the United States, perhaps had no place to stay, and had no work lined up upon their arrival in their new world. They were Italian and knew they had the substance needed to make it. This internal coding that “things will work out” is a deeply engrained element of Italian culture—don’t sweat the small stuff. Just give us the opportunity, and we’ll make something of it. Got fruit? Italians will make custom liquors or the most scrumptious jams. Milk? The finest cheeses. Animal hides? World famous shoes, handbags, and belts. (Think Gucci, Dolce and Gabbana, Prada, and Versace.) Meats? How about soppressata, salame, prosciutto, pepperoni, pancetta, and mortadella? Oh! And do I even have to mention Ferrari, Maserati, and Lamborghini?! Italian immigrants were mostly poor peasants and farm workers. My paternal grandfather, Antonio DiNauta, did own land with his family in Italy, but most immigrants had nothing to lose. 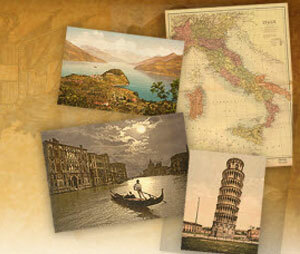 America offered them what Italy could not at the time—hope and a fresh start. At one time, Italians made up as much as 80 percent of the population of the famous French Quarter in New Orleans, Louisiana. So what does it mean to be fiercely Italian or to grow up under the influence of Italian culture? Well, it’s a way of life that, although a family may be generations removed from the old country, still permeates nearly every element of the family culture from generation to generation. I asked my brother to share some of his thoughts and memories about our Italian childhood. We agree that food, faith, work ethic, music, gardening, home décor, lifestyle—all parts of the life of an Italian family—breathe and speak Italy. 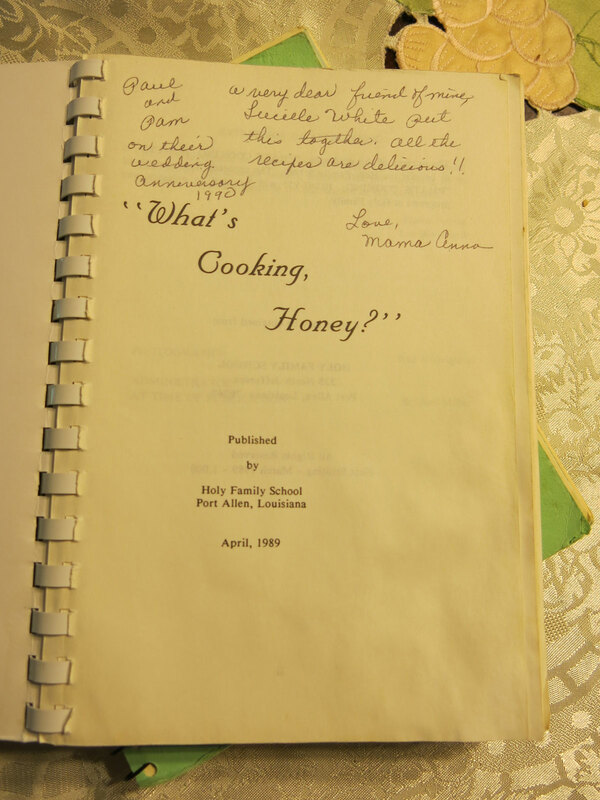 Inscription from my mother, Anna Nauta, in a community fundraising cookbook that included some of her recipes. 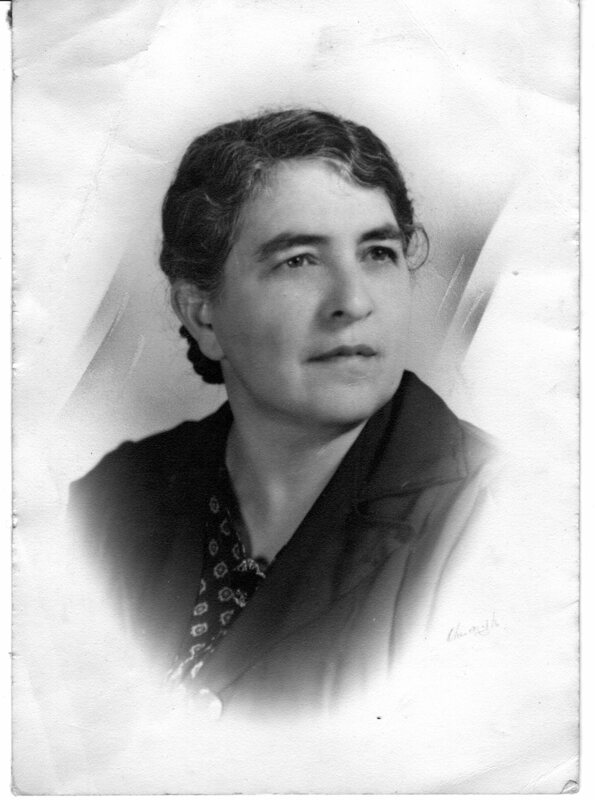 My Sicilian mother, Anna Michelli (Miceli), was a chef by trade. Managing the cafeteria at a large Catholic elementary school in Baton Rouge, Louisiana, she would continue her passion every day at home. I frankly rarely recall conversation that I had with her over the years that was conducted outside her kitchen. That’s where she performed her works of culinary art, told her jokes, chatted, made everyone feel like family, greeted everyone when they entered the house, and scolded us. In fact, when she ever did sit down on the couch for a respite, she would quickly fall asleep, exhausted. She always cooked for twice the size of our family, and, amazingly, unexpected daily visitors always seem to pop in about dinner time. And there was sufficient for all. She was always modifying recipes to share with local Catholic charity organizations for their cookbook fund drives, and she’d add her changes in writing in the margins for the next edition. 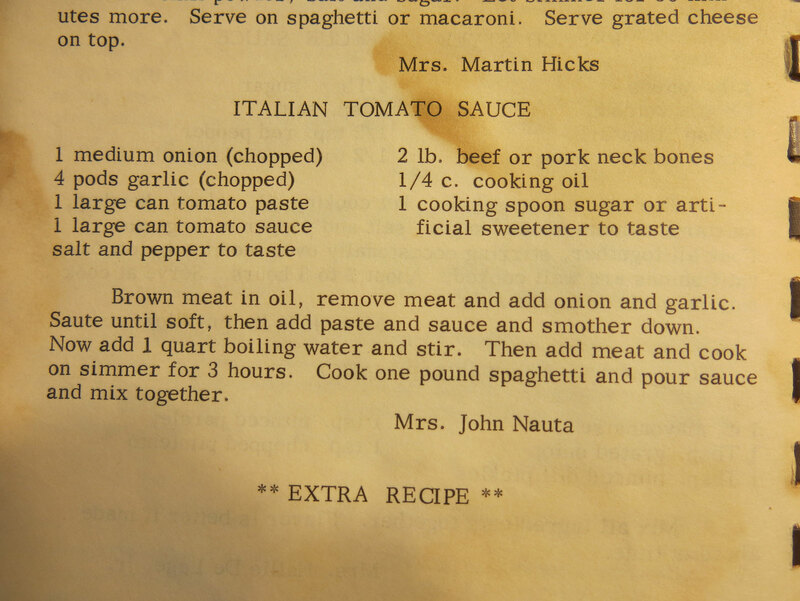 Mom’s famous homemade ragu recipe. I use pork sausage in lieu of the pork neck bones. Holidays were just another excuse to eat in grand fashion. There would be all the staple Italian pasta and meat dishes, accented by countless Italian pastries and delicacies. My mother and grandparents taught us children how to cook from a young age as well. Preparing meals would often be a family affair. Everyone had a task—and no one left the kitchen until the cleanup was done! On days she didn’t cook, she’d say, “If you don’t smell it cookin’, don’t bother lookin’.” That was not only a testament to her need for a rare break from the kitchen, but also an ode to the incredibly intoxicating smells of Italian food that were always permeating the air in our home. I don’t know that faith can be separated from society in an Italian community. In our home, we had a crucifix over every door and a rosary hanging on every bedpost. A statue of the Virgin Mary or some other saint usually adorned our yard, and statuettes and photos of the same and paintings of the Savior, if not of the Last Supper, were reverently displayed throughout our home. We prayed and gave thanks over every meal and dropped on our knees morning and night to give proper thanks for the gift of a new day and being watched over through it. Italian immigrants filled local labor shortages on farms, plantations, and production facilities. My grandpa Jack Michelli worked in the local pasta factory, and later delivered meats and produce to neighboring towns, which would lead to him opening his own mercantile (Michelli’s Grocery) on old North Street in downtown Baton Rouge, Louisiana. In time, hardworking Italians strengthened the community, filling critical roles in the fire and police departments, medical care, education, and politics. Italian immigrants were generous (and still are) in supporting local charities, building churches, schools, and facilities dedicated to promoting fine art. And they were fine additions to local athletics. My family served for generations in the local Catholic churches and supported fundraisers and service projects perennially. 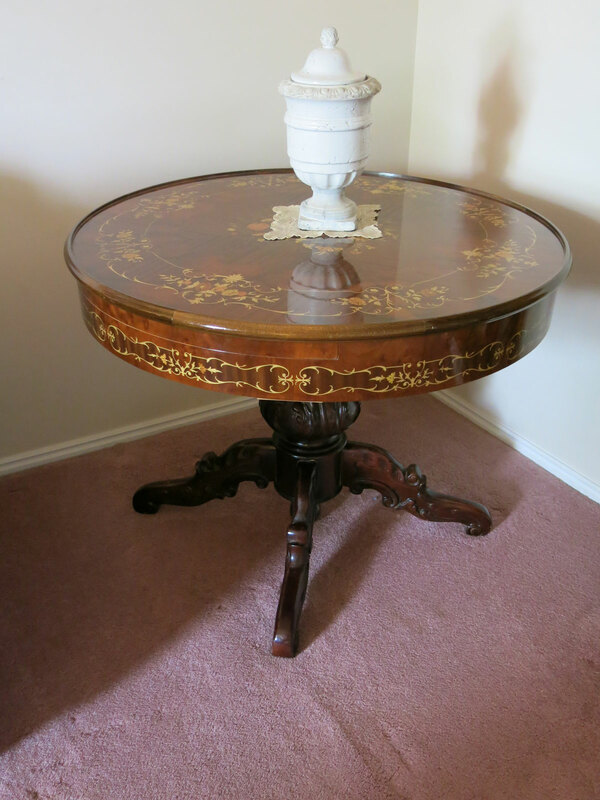 Handcrafted Italian in-laid wood table from Sorrento, Italy. Italian immigrants were hardworking. My parents and grandparents had no patience for indolence. If they were working, the kids had better be doing something productive. My mother was first to rise in the morning and last to retire to bed at night. My grandparents next door were the first to rise and first to bed. They worked tirelessly and expected us to do the same. You had to “earn the right to play.” If we weren’t awake on the first morning call, my mother would pull us out of bed by our toes. Perhaps that’s why I enjoy pulling my children’s toes until they crack while they are lying on the floor or couch—very much to their dismay and horror. We worked beside our family. We were not allowed to shy away from daunting or unfamiliar tasks. While we worked, our elders filled our minds and wove into our hearts countless rich stories of success, failure, triumph, endurance, and hope, inspired by the stories and memories of our ancestors. They wanted us to know the shoulders we stood upon, the substance we were made of, and how to provide for ourselves and our families against the ebbs and tides of hardships that would most certainly befall us throughout our lives. They expanded our skills by sharing with us their talents and the crafts, tricks, and tips of the family trades and by teaching us how to build and repair things. And if we couldn’t do it ourselves, we learned how to lean on the extended family and the Italian community network for the most reliable and inexpensive assistance—something my family and I still do today. I owe my love of gardening to my maternal Italian grandparents, Jack Michelli and Angelina Pizzillo. Toiling by my side, they taught me the rudiments of fertilizer, sun, and water—the key elements to any successful garden. In the square feet of our shared garden, they taught me that hard work, diligence, and tending to the important things reaped great outputs. I also took great pride when my mother and grandparents taught me the intrinsic joy associated with taking portions of my produce to share with the less fortunate in the neighborhood and community—blessings I still enjoy carrying out today. Perhaps you haven’t given it much thought, but look around your circle of friends and co-workers, businesses you frequent, clothes you wear, products you use, celebrities you favor, and places you like to frequent on vacation, and you could very well be pleasantly surprised to find that you too have been living under the influence of Italians throughout your life. Note: You can build and share your family tree at FamilySearch.org and search millions of historical Italian records for free online in FamilySearch’s Italian collections and in the Italian National Archives. Millions more records are added yearly as part of a project to digitally preserve and increase access to Italy’s historical birth, marriage, and death records. See FamilySearch.org/Italian-ancestors. Paul Nauta is a guest blogger at FamilySearch.org. He’s a family and family history enthusiast and loves just about everything Italian and outdoors. Follow on Twitter @nautapg or email at paul.nauta@gmail.com. 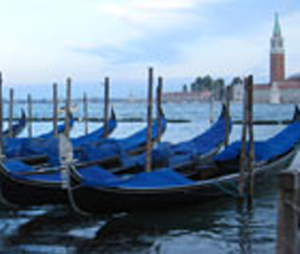 Finding Your Venetian Ancestor Just Got Easier!